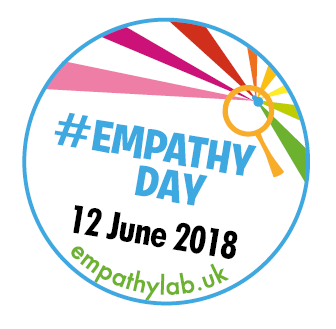 After a successful pilot last year, Empathy Day, established by EmpathyLab, will now be a national event and will take place on the 12th of June every year. The aim of Empathy Day is to reach out to children aged between 4 and 11 years old, their parents, and their teachers, and to encourage them to use stories to develop empathy skills. It will also encourage children to become active in their community and help to improve literacy. The 2018 Read For Empathy Guide lists some powerful children’s books that you can use to explore empathy with your class. There are poetry books, picture books, graphic novels and chapter books to choose from. Have a look at the resources available on the EmpathyLab website. There is an Empathy Day Guide, which lists lots of terrific ideas to use with children and plenty of templates available to download. Some of the activities include writing a postcard as if from a book character to reflect on what they have been experiencing, giving children empathy glasses to wear to really focus on what a character is feeling, and making footprints to stand in the characters shoes and say how they feel. Children can create their own pledge cards, on which they can write about how they will put empathy into action. Follow the blog tour of the 2018 Read for Empathy authors and illustrators. It starts on the 4th of June! Follow @EmpathyLabUK on Twitter. If you organize an event or activity and wish to tweet about it, use the hashtag #ReadforEmpathy or #EmpathyDay. Empathy Awards will be given to book characters showing exceptional empathy from children in 14 pioneer primary schools. Why not have a class debate or a vote to discover what book character your children would give an Empathy Award to. I recently read Boy 87 by Ele Fountain and Goldfish Boy by Lisa Thompson, both of which I’d highly recommend for teaching about empathy. In Goldfish Boy Matthew battles with chronic OCD with severe fear of germs and sickness, while in Boy 87 Shif is taken from his family and imprisoned, before he begins a perilous journey in search for a new life in a new country. If you have a favourite book or book character for teaching about empathy, feel free to share it with us. Posted on June 1, 2018 by Laura Brett. This entry was posted in Book news and events and tagged Empathy, Inclusion, Primary. Bookmark the permalink.